Fly-By promotions are some of the best ways to increase brand awareness! Like carrying your office on your back, this checkpoint-friendly laptop backpack handles your daily business in a fully mobile way. Padded laptop compartment inside the back zippered compartment transports up to a 17" laptop and allows for easy airport inspection. Additional space in the multi-section main compartment is also provided for your textbooks and work files. Also includes a padded pocket dedicated to your tablet or e-reader. One side of the backpack offers easy-access bottle and accessory pockets so you can even pack your daily re-supply. Quick-access front zippered pocket opens into an efficient organizer for pens, keys, electronics and other small items. Another front zip accessory pocket provides a spot for your airline tickets or media player. With its padded mesh back, S-shaped padded shoulder straps, rear trolley strap and collar comfort edge, this custom backpack makes your comfort its highest priority. One strap even features a built-in cell phone/media pocket to make your phone that much easier to reach. Made with 600D polyester fabric with signature High Sierra® hardware. Perfect for entrepreneurs, on-the-go business partners, college students, frequent business travelers and so many more. 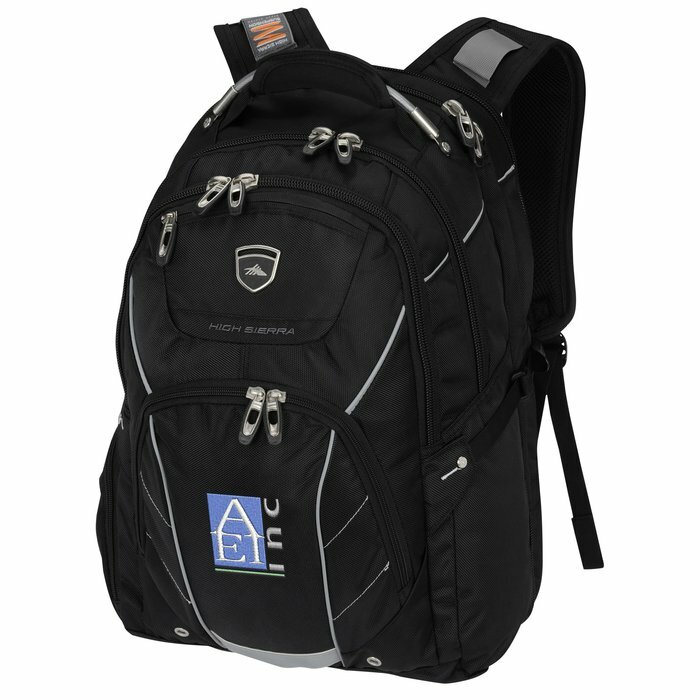 If you would prefer a heat-transfer imprint on this backpack, see item #120727High Sierra Elite Fly-By 17" Laptop Backpack. Size: 19-1/2" x 13-1/2" x 10". Your price includes embroidery on the front pocket. One-time tape charge: add $35 for fewer than 24 pieces; FREE for 24 or more! * Excludes art preparation time, applies only to orders of 24 items or fewer.